Hanna Boudreaux has lived in the small town of Willow all her life. She’s sweet, cute and quiet. Hanna has a moment of epiphany when she realizes her crush for forever, Raiden Ulysses Miller, is not ever going to be hers. She sees her life as narrow and decides to do something about it. Raiden Miller is the town’s local hero. 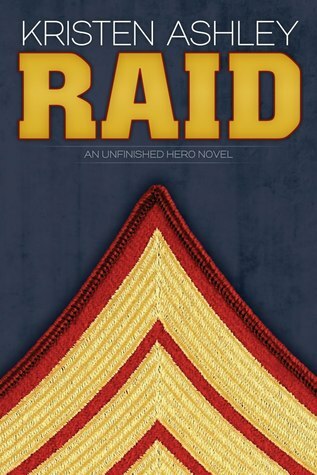 A former Marine with the medal to prove his hero status, he comes home, shrouded in mystery. It takes a while, but eventually Hanna catches his eye. After all these years of Raid and Hanna living in the same town, the question is why? Is Raid interested in Hanna because she’s sweet and cute? Or does Raid have something else going on? Raid was better than Knight or Creed. Period. I fell in love with Hanna and Grams. Raiden is strong and of all three of the unfinished hero men, the most human in my eyes. I read somewhere a reviewer said that she disliked that KA glossed over the PTSD that Raid was going through, but I didn’t see that. I thought it was handled well and truth be told I thought the whole story was well told. It was a quick read, but totally worth it. The epilogue made me cry hard. Like a little girl. A really nice 4 lipstick novel!